This is a monthly occasion held on the last Friday of each month, whereby children whose birthdays fall in the particular month gather with their parents at the Hall of Great Compassion (Da Bei Dian) for the celebration. It is a day for the children to show their gratitude to their mothers for suffering the discomfort and pain while carrying them during the 9 to 10 months' gestation period and in giving birth to them. 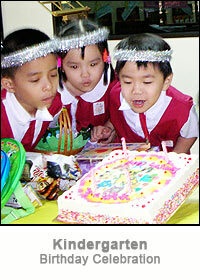 The occasion is generally a happy event for the children with action songs, birthday song, refreshments, and, best of all, receiving their birthday presents. A day away from class work. A day to relax, enjoy the fresh air and appreciate nature. 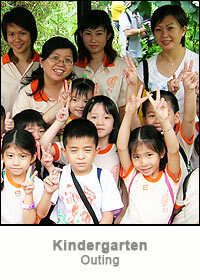 Teachers with ample help from Ai Xin Ma Mas take good care of the children. 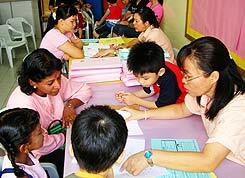 Thus parents have peace of mind in allowing their children to participate. 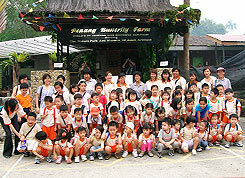 On Wesak Day , the children, their parents, Ai Xin Ma Mas, and teachers performed the Bathing the Buddha ceremony. 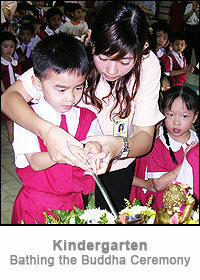 In the ceremony, they use a ladle to pour fragrant water three times over a statue of the infant Buddha. 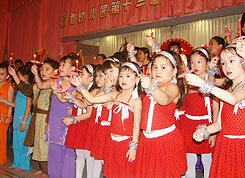 The senior residents of Wan Ching Yuen Centre also join in with the children to perform this ceremony. 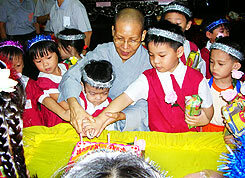 Venerable Wei Wu explains to the children that the act of pouring fragrant water over the shoulders of the Buddha serves as a reminder to cleanse the mind from the three poisons of greed, hatred and ignorance. The ceremony symbolizes the washing away of greed, hatred and ignorance and purification of one's heart and mind. 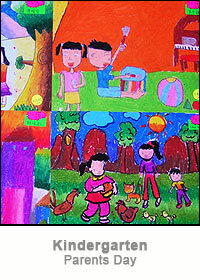 This two days one night camp has the theme: “Towards self confidence and independence”. It is opened to our six year old children. Activities include going for outings, cooking, music and movement, art & craft, story telling, living skills, learning filial piety to parents and paying of respect to the elders, and drama. 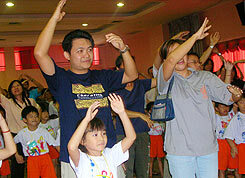 Parents are invited during “Happy Hour” to join in the activities of the camp. Parents Day is the day of opportunity for parents and class teachers to meet face to face and discuss the child's improvement and achievement. The parents are reminded that the results of assessment in the Progress Book are not to grade the children, but to help teachers evaluate and upgrade their teaching skills. This is a proud moment for the six year old children who have “graduated” (complete with mortar and scrolls) from preschool education. 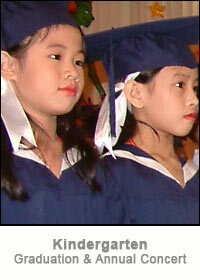 The children are reminded to study diligently and become praise-worthy citizens to society when they grow up. The Concert with programmes of multi cultural performances, dances, recitations are all put up by the children, after much hard work done in rehearsing and preparing for the event. 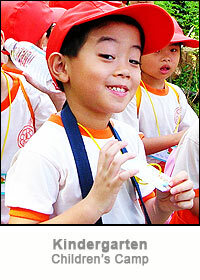 With the teachers' guidance, the children give their best in all the performances.